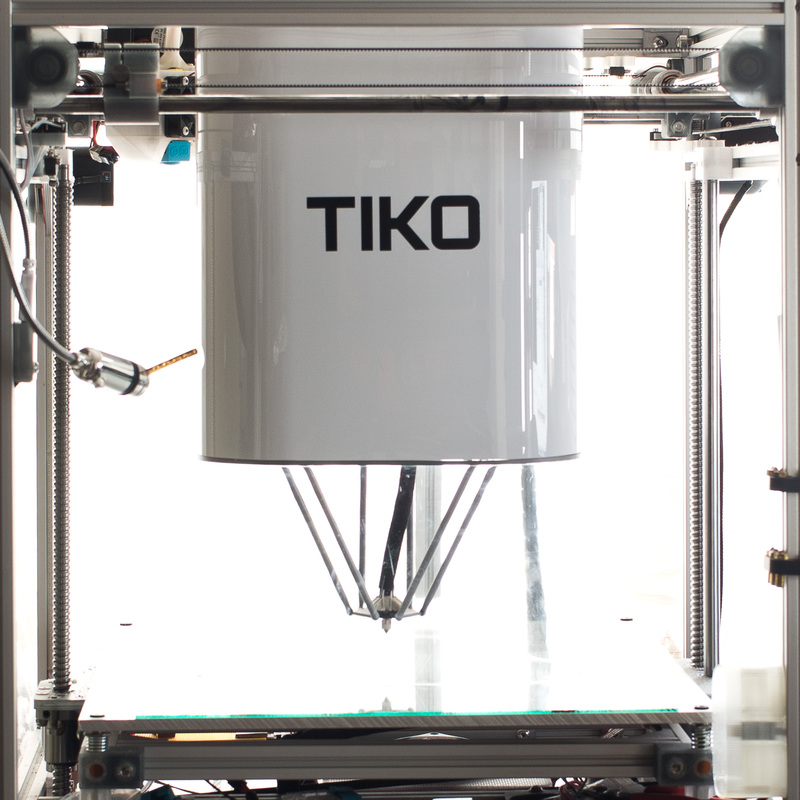 Setup was quick and easy with the Tiko, which is not something that’s often said about 3d printers. My custom DNS settings meant I had to access Tiko with an ip address, but that was clearly mentioned in the startup guide. When it comes to getting started guides and a detailed FAQ on their website, they are well ahead of what I’m used to from a small company, and well beyond what I expect from a Kickstarter project. They also did a really nice job on the packing foam, not something I would normally notice or mention. I like how you can use Tiko as a WiFi hotspot and connect to it wirelessly, it’s kind of a surprising feature on a budget printer. It means you can take it and use it almost anywhere you have power. There are some issues with the current implementation though. I don’t like how it always creates an unsecure WiFi hotspot. I don’t like how anyone nearby can connect to and control my Tiko. I don’t like having an unsecure device connecting to my home network to get updates. And I don’t like having to switch networks every time I want to access the Tiko (it’s particularly annoying if you store your STL files on a network share that you can’t access when you’re connected to your Tiko). I believe all the networking issues are temporary though and we’ll be able to use Tiko (the printer) through a local WiFi network once Tiko (the company) writes the software to make this possible. The current interface makes it sound like they’re working on a cloud platform, but I’ll be happy if I can set a password on the Tiko and access it through my local WiFi network. For now, I unplug the Tiko when I’m not using it (it doesn’t have a power switch). Tikos startup time, including the time it takes to start up the hotspot, is surprisingly fast which is nice, so having to turn it on and off isn’t too much of a hassle. My Tiko arrived with almost no controls, just temperature, layer height and infill density. But they’ve been busy at Tiko HQ and within a week, a new update was out with a lot more settings, making the built in slicer much more useful. I’ll probably end up using Simplify3D at some point, since that’s what I use with my other printers, but I figured I give the built in slicer a try first. I expect most people will want to use the built in slicer or try Cura (Simplify3D was more expensive than my Tiko). There does seem to be a bug where it feeds filament forward instead of unloading it if you tell it to unload the filament after you’ve aborted the print through the tilt detection. But I assume it’s probably something trivial, maybe a missing “G92 E0” at the start of their load script, with their frequent updates, I don’t expect that to last long (and last time I tried it, it worked, so it may have been fixed). One feature that would be really useful is some kind of indication if it’s connected to the printer. As it is now, everything looks like it’s working when it’s not connected, but if you try to do anything it’ll get stuck “checking for filament”, which makes you think there’s a filament loading problem when it’s really a networking issue. I suspect simply changing that message from “checking for filament” to “connecting to Tiko” would save some their customers a lot of frustration. 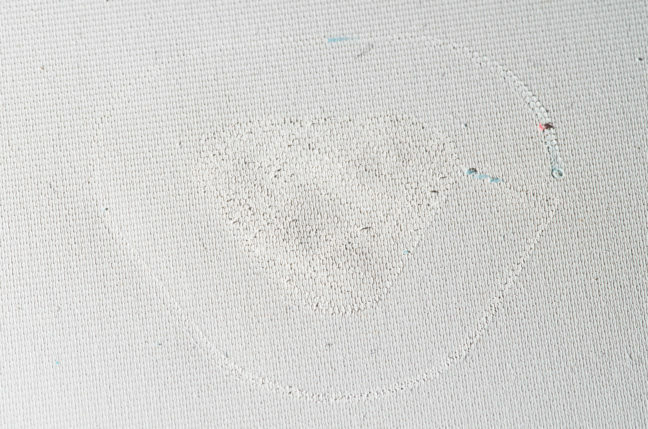 The print surface is made from a textured rubber. I’ve never used a rubberized print surface before. It seems to work pretty well with a raft, but it is starting to show signs of wear. At some point it wasn’t sticky enough, which I fixed with some hairspray, though washing it might have worked just as well. With the way Tiko’s designed it’s pretty easy to use your own build surface. I’ve been using 1/8″ polycarbonate sheets which has been working pretty well. It’s easier to remove the prints (it’s more flexible than the Tiko build plate) and polycarbonate doesn’t require rafts (though I don’t see any way to disable rafts in the current software). The construction quality is pretty good overall (and much better than I expected out of a $200 printer). All the wiring uses removable connectors, the lighting is very nice (except when it’s flashing). 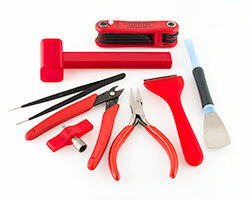 And it’s easy to disassemble that parts you’re likely to want to disassmble. I’m impressed that they were able to put together and deliver a printer for such a low price. The lower section is molded out of clear acrylic. While it’s optically clear, it warps the light enough to make it hard to look through, even in the flat sections. It reminds me of looking through someone else’s glasses, and is not a comfortable experience. 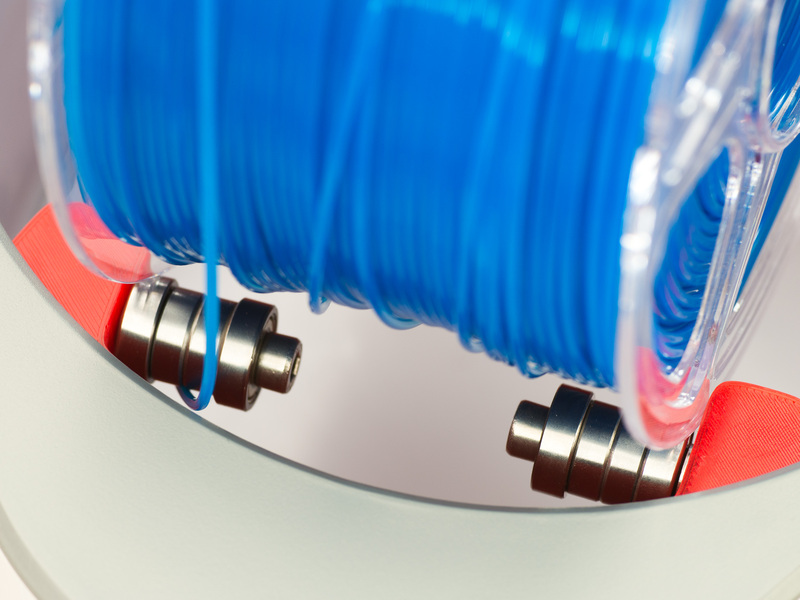 There is a lot of play in the motor mounts / rack and pinion system. Some way to reduce backlash will probably improve print quality. One fix is described in Fixing the Motor Mounts. The 6 delta arms are very flexible, though I’m not sure how much of a difference it makes with Tiko’s relatively slow printing speeds. One upgrade is described in Reinforcing the Delta Arms. The motion control is underpowered, which causes it to miss steps too easily. I don’t know if it needs larger motors, more current, reduced friction, better alignment, or just a break in period. 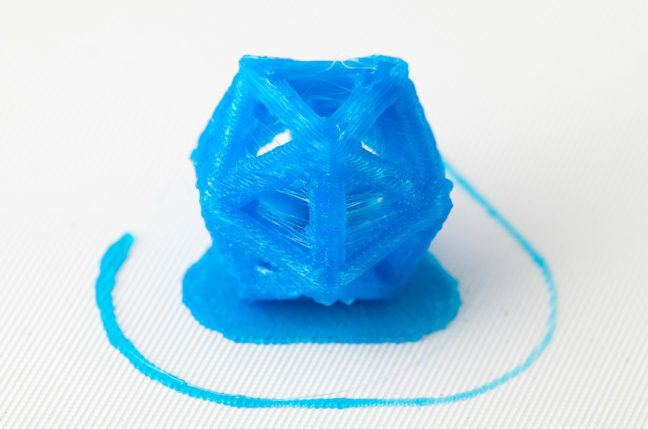 It looks like they switched to a 0.5mm nozzle at some point, I think 0.4 is a better general purpose nozzle size for a small printer, but a 0.5mm nozzle is less likely to jam with specialty filaments. I like the design of this printer, the layout is well thought out, resulting is a compact, pretty, and quiet printer. The size and weight makes it easy to carry around, and the unibody design means I’m not worried about anything getting out of alignment during transport. The parts are all modular and easy to replace. The lack of fans makes it very quiet while running, and completely quiet when it’s not moving. Most of the noise it does make is amplified by the plastic shell, so adding soundproofing foam may make it even quieter. The full enclosure does make it harder to access the prints and the nozzle, but it also makes it much safer to operate around kids. I can see why they chose to design the Tiko around 165mm spools, it fits so perfectly between the delta arms. I don’t plan to use a lot of filament that fits in the Tiko spool holder though and never actually used the spool holder the way it’s designed to be used. I made a adapter for larger spools and it’s working well for the Tiko spool and the 200mm diameter spools I typically use, but I have other spool holder ideas I may try at some point. I started with this version primarily because it could be made small enough to be printed on a Tiko. The worst part about Tiko so far is it’s print quality and reliability. I wasn’t expecting much from a $200 printer, but with the effort put into everything else, I would have thought it would do better. I don’t expect it to be as fast, or as high quality as my more expensive printers, but I did expect Tiko to print reliably, without layer shifting, and with better quality. I have 0nly used Tiko’s software so far, so there’s some hope that using other slicers and future software updates will improve things. And I expect in 6 months, between Tiko and the community, we’ll figure out how to get the best results out of our Tikos. But for now here are some of the problems I’m seeing (based on the default Tiko settings). Layer shifts even at the default printing and travel speeds, probably caused by a combination of underpowered stepper motors, overhangs curling from lack of cooling, backlash, and other factors. Lots of stringing, probably due to slow travel speeds, retraction speeds, and a very aggressive z-hop setting. The lack of air cooling means new layers are often placed on top of layers that are still rubbery. You can watch that happen with the test print, at least with PLA. You can see what happens when I add part cooling to the Tiko in a followup post: Tiko Part Cooling. Integrating cooling into the Tiko may be more complicated than I thought. Straight lines aren’t really straight with the Tiko (or even curved, they sometimes come out wobbly). I suspect that’s the result of backlash in the motor mounts (see Fixing the Motor Mounts). I suspect my Tiko’s printing temperature may not be accurate, or maybe it’s my other printers that aren’t accurate. Either way, my Tiko seems to prefer temperatures well below what I’m used to. I’ve been running mine at 180°C and would try lower if their software allowed it. I usually default to 200°C with PLA, but I’ll range from 190 to 240 on my other printers depending on the filament and the print. 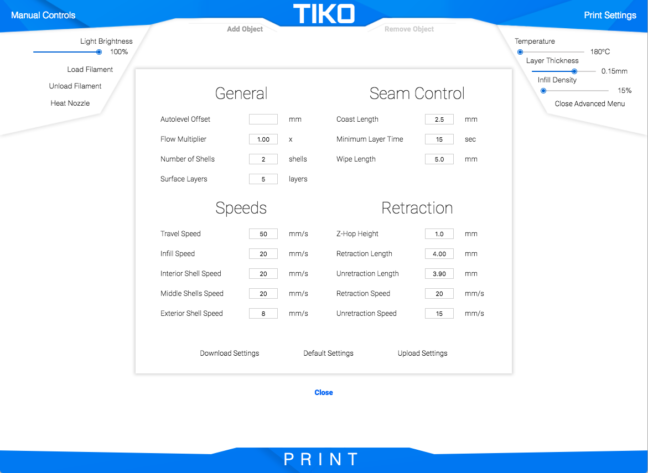 Another thing I normally wouldn’t mention, but Tiko website has a lot of useful info (not just marketing stuff) and is worth checking out if you want to learn more about the printer. Unlike most of the backers, I got the Tiko more to play with and less to print with, as I already have other printers that are better suited to the things I like to print (and are significantly more expensive). But now that I have the Tiko, I’m thinking it will be a fun portable printer if I can get decent print quality out of it. Many of the printers I’ve seen have started off with pretty questionable print quality so I’m not too concerned about the initial result. With the size of the Tiko community and the Tiko employees hard at work, I’m sure we’ll figure out how to get the best out of our Tikos. The one area that I find most promising for Tiko is as a child friendly printer. The only thing that seems potentially dangerous on the Tiko is the hotend, and it’s very small and very hard to get at. The unibody construction, full enclosure, low power motors, and tilt detection make it hard to damage the machine itself. 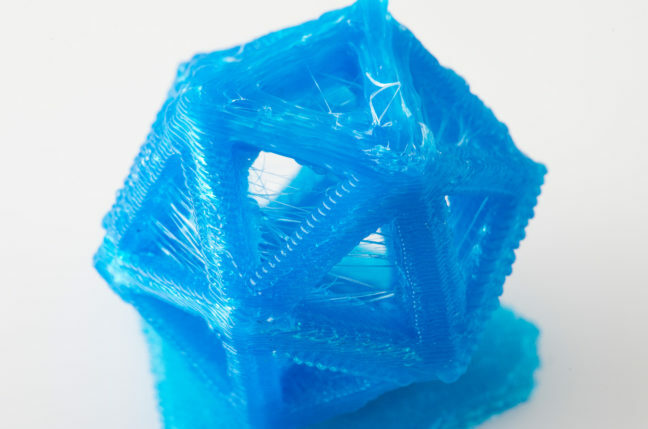 I wouldn’t hesitate to let others who are new to printing use it, including children. So if you’re looking for a printer that you can use today to start pumping out lots of prints, you should probably spend more and get something that’s proven to be more reliable. If you just want a printer to play with, go ahead, buy a Tiko, and join the rest of us trying to make it work better. It’s a fun little printer.